A friend to help you. Stand on two pieces of A4 paper, one for each foot. Hold a pencil upright at as close as a 90 degree angle as you can, and draw around the foot. Pay special attention to the heel area. Hold the pencil at a 45 degree angle and draw from the inside edge of the heel, around under the arch to just behind the big toe joint. This shows the arch and helps make the right choice about the last. Locate the centre back of the heel. 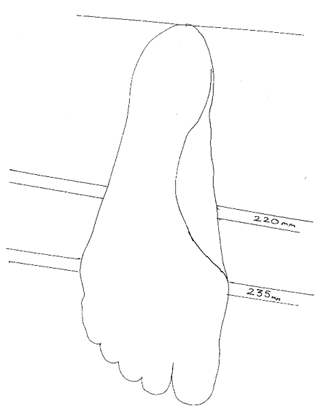 Place the ruler at a 90 degree angle to the floor and draw a straight line with the ruler up against the back of the heel as shown in the drawing. Slide the tape measure under the front of the foot at the widest part and measure all around the foot as shown in the drawing. Pull the tape snugly around the foot – Ideally you are taking the measurement from the big toe joint across to the point just behind the 5th toe – the main thing is to mark exactly where you are taking the measurement. Measure in millimetres. Now measure the highest part of the foot at the instep – again marking exactly where you are taking the measurement. Write the measurements next to where you have wrapped the tape around the foot.